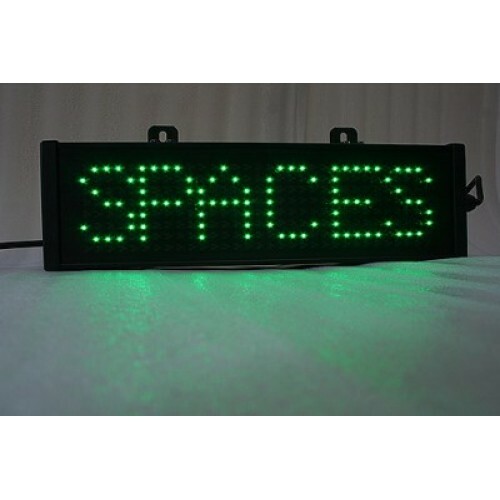 * Full matrix characters for easier reading * Ultra bright RED LEDs for Full and ultra bright GREEN LEDs for Spaces. * Simple volt free input to switch text * Aluminium enclosure powder coated * Anti glare front screen * Integrated power supply * Units can be wall or ceiling mounted. * Outdoor IP65 rated weatherproof case * 160mm character height, readable to 80 metres *Enclosure Dimensions 680mm x 200mm x80mm *Other sizes available. Please enquire For a bespoke sign, please contact the office on 01604 438188.